We at the Australian Muslim Women's Association have been inundated with emails and phone calls expressing messages of support, understanding and offers of help after we joined with others leaving tributes at Martin Place. We cannot express deeply enough how much these messages of support have meant. Like the rest of Australia we are reeling and in grief for the terrible tragedy that unfolded over the past few days with the Martin Place seige and the tragic loss of life of the heroes Tori Johnson and Katrina Dawson. Our hearts go out to their families and especially the children who have lost the love and grace of their beloved mother. Violence is not an answer to the political and social conflicts that currently rage across our beautiful planet. Unfortunately there are still many each day who continue to suffer from such violence, but we hope that the example that we have seen amongst our Australian community - the coming together, the sharing of grief and the compassion for each other - will have a positive effect on other parts of the world where communities remain divided. Islamic Council of Victoria on Attorney General's comments on Gaza bombardment. Press Release by Lebanese Muslim Association on the resignation of Mike Carlton. It is with horror that the Muslim community views recent media coverage of the actions of ISIS and in particular, the actions of former members of the Australian Muslim community in committing appalling atrocities in Iraq. Reminiscent of the worst atrocities committed against Muslims under the Spanish Inquisition, or the Mongol advances across Muslim lands centuries ago, the behaviour and actions of ISIS have no semblance of justice, of Shariah, or relationship to the teachings of Islam. There is no excuse possible for the demands being made of non-Muslim populations, for the beheadings, the slaughter and the general massacre of innocent civilians. Every verse of the Quran and every action of a Muslim must begin with the words - Bismillahi Rahman Raheem - In the Name of Allah, the All Merciful, the All Compassionate. There is no mercy or compassion in the behaviour of ISIS and they will receive no Mercy from their Creator when they face justice for their actions. What is even more horrendous is the involvement of young children in their appalling crimes which can only result in severe trauma and psychological damage to these young children who are learning about savagery at such an early age. Indeed, the gunning down of women and children, the indiscriminate slaughter of families who have no involvement in a nationalist struggle for Somalia, is a commitment to evil that has not only robbed the perpetrators hearts of any compassion, guaranteed their punishment in the afterlife, but caused terrible grief for the slandered followers of the Quran and Sunnah throughout the earth. What is equally distressing is the news that yet another Muslim revert, Samantha Lewthwaite, a supposedly average British girl, has followed this aberration of our just and ethical religion. As an adult woman she must bear responsibility for her own actions, but equally questions must be asked of the community that taught her about Islam, and turned her and so many other young souls into murderous thugs. In whatever capacity our organization has, we condemn the continual slaughter that is being perpetrated by those who no longer value human life – whether by government forces, drone attacks, or violent resistance. The Quran relates that man can rise above the angels with the wisdom, firmness and mercy that has been shown by Prophets through the ages, or cause misery and destruction as predicted by the angels at the time of the creation of Adam. We urge the Muslim community to redouble its efforts and rekindle the ethical, restrained and just practice of the Prophet Muhammad through deep study of the history of Islam and its sources and to reject simplistic and violent solutions to long term problems. The earth is burdened by the continual shedding of blood, and it will only be through determined and spiritual leaders that justice and peace can return. AMWA condemns the low budget, poorly prepared film that claims to present aspects of the Prophet Muhammad s.a.w. This film does not warrant more than a few lines of condemnation as it is clear that its goal was deception from the beginning. The intentions were deceptive in attempting to denigrate a Prophet of God, the Prophet of Muslims and the Messenger sent by God to all people whose noble example has been recognised by all independent minded people throughout the ages. The actors have claimed that they were deceived, the director, organisers and funders of this pathetic film do not have the courage to explain their actions or their involvement and are therefore acting deceptively, and the translation of a film that would not have achieved any real audience, into Arabic to be launched on websites around the world was also deceptive in conduct. We urge all Muslims to politely ignore this film, and to behave in such a manner in their family, working and community life that demonstrates the noble character and teachings of their Prophet. We urge all Muslims to understand that the goal of this deceptive film is to provoke their anger and thereby to encourage them into reprehensible action. The Prophet Muhammad s.a.w. said 'do not be angry, do not be angry, do not be angry'. His example of self-control, even when persecuted, insulted and maligned was always one of composure. As his followers we need to also adopt such a manner. Recently the NSW Parliament passed legislation required that women who wear the burqa must reveal their faces where their identity must be confirmed. This applies to random breath checks, speeding fines, the signing of a Statutory Declaration and various other legal occasions when the identity of a person must be witnessed. These are fair laws and certainly overdue. Although some in the Muslim community may consider them targetted specifically at Muslim women, the burqa is still a legitimate form of clothing that can be worn freely in Australian society and its educational institutions unlike its counterparts in European countries especially France. The Australian Muslim Women's Association spoke widely on the matter in early July when the bill was passed in NSW. According to Jamila Hussain AMWA's representative, and lecturer in Islamic Law at UTS, who was interviewed on the ABC program AM, "if you live outside an Islamic country, then you have to obey the law of the land. And if the law of the land says that you need to remove your face veil for identification, then you should do so. And you really have no excuse for not doing so." Silma Ihram - education consultant and training college director stated that "it was inevitable that this would eventually come about because of the fact that identity is such a critical part of all of our interactions legally." AMWA recommends however, that the implementation of this new legal requirement is carried out with sensitivity, wherever possible with female police officers, and with appropriate training provided to the relevant legal departments. Hopefully this sensible solution will ensure that respect for diversity is maintained and continued in our country. In late 2012 an historic event occurred with the first joint Press Conference of its kind held by leaders of Sydney's Muslim community at the Lakemba Youth Centre. This was a direct and swift response to the violent street protests following the release of the US film denigrating the Prophet Muhammad s.a.w. This press conference was indeed historic for a number of reasons. Most importantly it demonstrated to those within and without the community that the leaders of the Sydney Muslim community will not tolerate violence in the name of defence of the Prophet s.a.w., nor accept that the hard work done in building positive relations in business, politics, interfaith harmony and community infrastructure could be set back by the reckless actions of a few. It was also the most involvement that Muslim women have had in being actively engaged across all forms of media, prior to the conference, during meetings before the conference and during the conference itself. The Press Conference received a very positive response from all media outlets. Although there have reports of hate mail directed at prominent members of the community, AMWA has received many positive messages from those contacting our website. Some of these have been included on the facing page. We would urge any persons in the community who suffer any form of backlash from the recent events surrounding the controversial film to first consider the items in this checklist which will give advice about how to respond. We are also collecting information about threats or intimidation and referring them onto the relevant authorities. • If you are angry at any recent event e.g. that is denigrating our Prophet, demonstrate his example by controlling your anger. • Think carefully before making any rash decisions or behaviour as these may have life long consequences and will not assist your family, the women in your home, your community or be pleasing to Allah s.w.t. • Encourage those around you to remember that the Prophet s.a.w. suffered many insults and abuse, but never retaliated in a harsh or violent way. He was patient and continued his teaching. If your mosque or leader is encouraging violence - join another mosque, do not get involved. * "I would like to express my appreciation to you all for your well chosen words and the example you have all set for all of us to follow. No matter your spiritual pathway of choice, tolerance and respect is the basis. We all need to keep that at the forefront of our minds as we live in this world together. Thank-you"
* "I am sorry that a number of Muslim organisations have received hateful calls.Please remember that not all non-Muslims feel this way - we all want to live in peace. Best wishes to you all at this difficult time""I felt I needed to discover a little more about Islam. * "I am from old Irish Catholic heritage - so I can understand how the act of a few or a section of a religous group can lead to much misunderstanding and condemnation." * "I read your comments on a news page and wanted to say - how I love and respect you Prophet - please dont take this as an insult to me your Prophet is like a Saint. A man who spread his words from God." 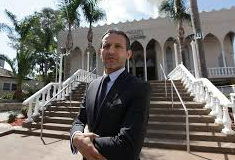 * "Please continue your wonderful work with your religion and hopefully a greater understanding can lead our nation being one that shines out as a country where all are loved and repsected for their beliefs and their love of all humanity." * "Please find it in your heart to pray for those who dont understand. I would pray to see the day when all religions stand together against violence of any kind." *" Hope my spelling is right but - salaam." * "Yet another comment about the riots. As a non-Muslim, I feel very comforted by the disapproval shown by Muslim leaders in this country towards the violence in Sydney. Similarly, I am disapproving of the backlash towards the Muslim community that I am hearing about. We don't need to be destructive towards each other. All the religions that I know of teach love, tolerance and generosity. Not much of that to be seen in the riots or the retaliatory messages. Shame on them all. God must be so exasperated." * It seems that hatred and violence are very easy to "whip up"." * "Peace, restraint and goodwill are the difficult things, so we all need to bring up our children in that spirit. This also means accepting that some idiots will provoke us throughout our lives and we need the strength and common sense to ignore them. They are idiots, after all." * "Please be aware that the Muslim community has support from others who are intelligent enough to separate the culture of thuggery from those who simply wanted to voice a peaceful protest about a stupid, third-rate trashy movie." * "I would just like to applaud the way the Islamic community and the Islamic leaders of Australia have handled the recent protests in Sydney. While I think the protestors did much damage, I believe the strength, unity, and message of peace and tolerance shown by the Islamic community following the events has been a glowing endorsement of Australia's multicultural society, and actually produced a very positive image of Islam within Australia." * " I would just like to applaud the way the Islamic community and the Islamic leaders of Australia have handled the recent protests in Sydney. While I think the protestors did much damage, I believe the strength, unity, and message of peace and tolerance shown by the Islamic community following the events has been a glowing endorsement of Australia's multicultural society, and actually produced a very positive image of Islam within Australia."